On March 15, 1943, Chance-Vought civilian test pilot Boone T. Guyton, was piloting an F4U-1 Corsair, (Bu. No. 02157), over the Stratford area. 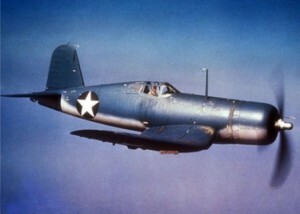 The aircraft had been brought to Chance-Vought and converted to a XF4U-3, with experimental equipment added. Mr. Guyton was testing the performance of the aircraft when the engine suddenly failed forcing him to make an emergency landing at Bridgeport Airport, (Today known as Sikorsky Memorial Airport.) Upon landing the aircraft struck a cement retaining wall. The aircraft was damaged beyond repair, and the pilot was seriously injured. Investigation determined that one of the rods in the engine had seized causing the engine failure. Boone Guyton, (1913 – 1996), was a well known test pilot and navy veteran. He wrote a book of his experiences called “Whistling Death: The Test Pilot’s Story Of The F4U Corsair, published in 1991 and 1997.